Since there is quite a lot of things to cover, today I’ll just show some unboxing pictures, how to connect all those modules to the board and run Android pre-loaded in the eMMC module, and I’ll do a more detailed review with Android and Ubuntu in another post. I received the kit in a large box sent via EMS. Here’s a picture with the board and all accessories present in the Box. 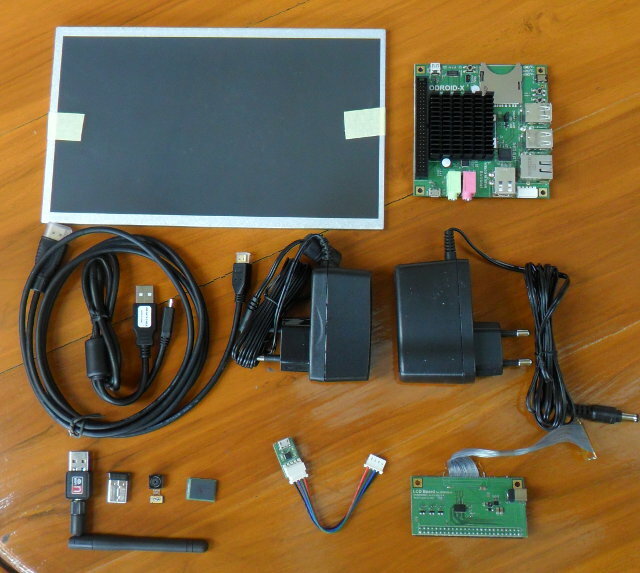 From top left to bottom right: 10.1″ LCD Modules, ODroid-X development board, HDMI to mini HDMI cable, micro USB to USB cable (for debugging), 5V/2A power supply for the board, 9V/1.5A power supply for the LCD module, WiFi dongle, Bluetooth dongle, 5MP camera module, 16GB eMMC module, USB to TTL board and LCD board. You’ll notice their is no documentation or CD included, that’s because everything you need is available on Odroid-X/Q project Wiki. Let’s have a closer look at the board itself with a top view and 3 side views where you can see the different connectors, jumpers and buttons. 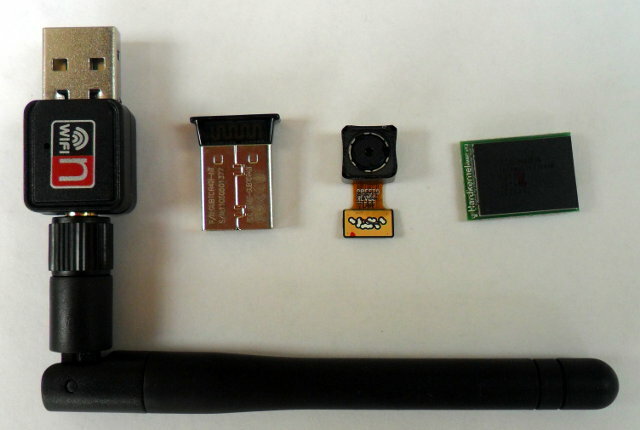 Here’s also a close up of the small Wi-Fi, Bluetooth, Camera and eMMC modules. Now let’s connect all those together, and add a USB keyboard and a USB mouse. The eMMC is clipped under the board and obviously not seen on this picture. 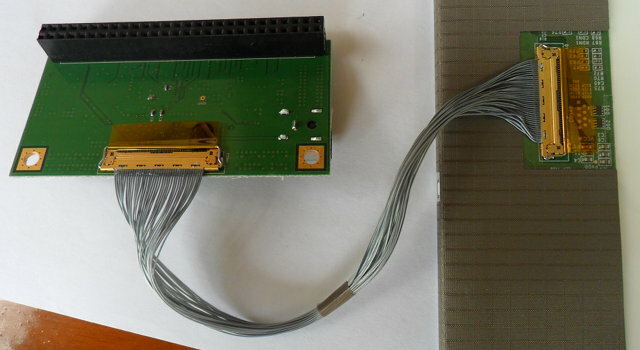 I’ve also added a picture showing how the LCD Module is connected to the LCD board. Once this is done simply connect the LCD board to the expansion header of the ODroid-X. The first time I connect the debug board to my Windows XP netbook, the device was recognized automatically and CP2104 USB to UART driver installed properly, but suddenly it was not recognized anymore. I eventually fixed this issue by installing CP210x USB to UART Bridge VCP Drivers available on Silicon Labs website. The boot took 25 seconds, the mouse, keyboard and Wi-Fi are working. That’s about it for today. I’ll give a more detailed review about Android, try all different peripherals and how I (hopefully) ran Ubuntu from a SD in another post. The full kit described above costs 366 USD in total including shipping, for what looks like a pretty decent ARM (notebook) reference design. The 10.1″ LCD module is sold out, but there is a slightly more expensive 14″ display available. All modules are pretty standard, so you may not need to buy all accessories, and just buy the board for 129 USD + 40 USD shipping, although I’d recommend the 16GB eMMC module (the performance should be better than SD card) and possibly the debug board, if you don’t have one already. You can find more information on ODroid-X page, get support in the forums, and get tips and How-tos by reading Hardkernel blog. Cool system, but pricewise out of my hands just for playing. Maybe I use this board or similar in the future for inside the car. Gps on linux is still crap but no xbmc is coming over to android. The carpc system is about to get born. Next android test: Can you dump the latest xbmc apk on there? Interested to see those 4 cores byting into vudeo without the help of vpu/gpu. $169 for a quad core board is actually a very good price, but obviously more expensive than A10 boards. 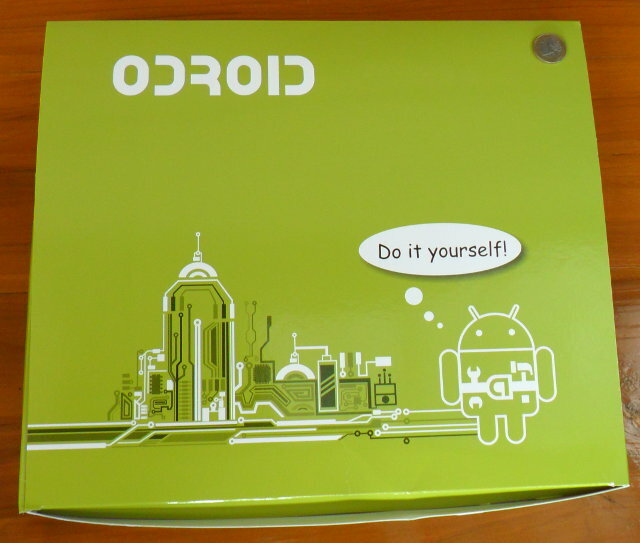 I got lucky as hardkernel sent me one kit for evaluation. 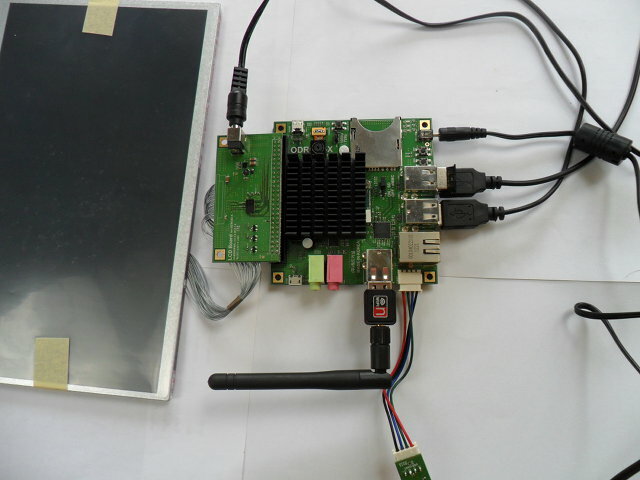 I haven’t been contacted about the OlinuXino A13. Once I write the review, I’ll give a try to XBMC APK. 1080p software playback might be possible. I know the price is right for what you get. Maybe I will buy one in the future, but I still thinj that if you have 4 cores you also should have more memory. Would love to see some heavy task performance in your reviews. I think you will not be able to get the most out of it. About xbmc, I know the x86 version does not have multi core support. Hope the android version is anle to tap into all the cores, but doubt it. wow, for a fully equipped development kit it’s actually a very low price. You would usually see such kits for $1500 or higher. Looks nice! I’m seriously considering buying one of these. Do you have any plans to try Ubuntu on it? That would be my OS of choice, since I would be using it as a server. Would love to know how stable it can run that. Yes, I will try Ubuntu on it, but I will probably test it only 1 or 2 hours to write a review, so it won’t really be a stability test… Bear in mind that Exynos 4412 is very new, it’s not in any products currently (AFAIK) (edit: Oups I forgot it’s in the Galaxy S3) and ODroid-X is a development platform, so we may not expect a bug free experience, but things will get better over time. I’m kind of hoping this board (or similar) will also be supported by Linaro since Samsung is a member. Yes, you’re right. It’s not much different from the latest Qualcomm MDP that costs over $1200, although the later is a full tablet with capacitive touch and battery, but still. Ooh! I’d be interested to see how it performs compared to an x86 desktop and say an Allwinner A10 device with 1GB of RAM, all running Ubuntu, specifically chromium rendering a few heavy pages. I’d like to use one of these boards to replace a 300W desktop that lies practically idle, but it does still need to have some kick to it. I just wonder whether the normal usb camera etc. devices can work with this board. Does the system must install in SD card? Can it installed on flash disk. the possibility of any chip burned. and the experience of reading pdf on ubuntu. I ask it in several forums but i get no answer yet. Is it possible to encode VP8 content with this board or only H264/Mp4 video content? It should be possible with software encoding, but if you need real-time VP8 encoding (e.g. camera input) that may be another issue which needs to be tested. I could play a WebM 720p video without issue, but WebM 1080p video was choppy (over the LAN). I suppose VP8 encoding is more demanding than decoding. Hey cnxsoft. I havent ordered the USB to UART cable from the accessories provided by hardkernel . Can you provide a link or a description of where I can get the cable from ( other than hardkernel that is ) . 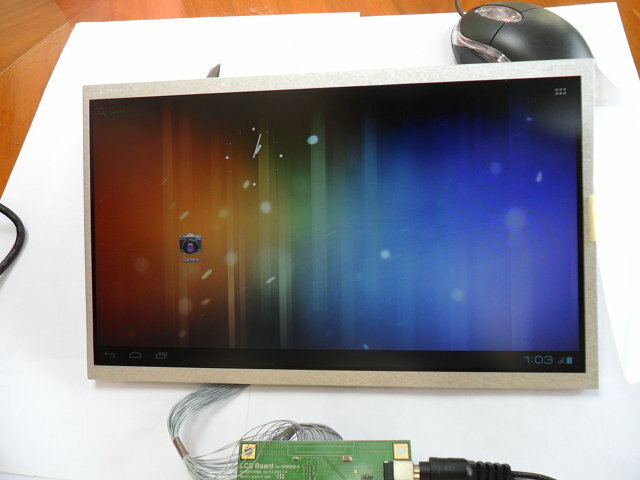 And can you also tell me how I can connect a touchscreen display to the odroid-x ? This should include the board and a few wires. where did you come across an eMMC card? can’t seem to find any site that sells one. Hardkernel website sells this eMMC.